Industry related bulletins, technical information, best practices & laws. PORTLAND-LIMESTONE CEMENT: Amendment to the BC Building Code from the BC Building and Safety Standards Branch – By order of Rich Coleman, Minister of Public Safety and Solicitor General and Minister Responsible for Housing, Portland-limestone cement was recognized by the British Columbia Building Code on Thursday November 25, 2010. The cement industry is now clear to start shipping PLC in British Columbia. Click here to view amendment document. Click here for more information on recent CAC studies. Most people don’t know the difference between “cement” and “concrete” and if asked they are likely to say something like, “I’ve never really thought about it but, aren’t they the same thing?” While cement and concrete are related they are nowhere near the same thing! Cement, which is the abbreviation of the correct name, “Portland cement” is a fine grey powder which looks very much like grey flour. Most people have never seen cement. Concrete is a mixture of cement, sand, rock, water and small amounts of additives. Concrete is the material we encounter in our everyday lives. The relationship between cement and concrete is similar to the relationship between flour and cake. While neither cake nor concrete can be made without the “flour” they are definitely not flour and like a cake, when the concrete has finished “cooking”, the flour is nowhere to be seen. Another way to think about it is that; cement is the glue in the concrete holding the sand and stone together. It should also be noted that like a lot of glues, cement doesn’t “dry”; it hardens through a process called hydration. Just as different occasions call for different types of cakes (one would never take Christmas cake to a 2 year old’s birthday party), different applications call for different types of concrete. While basic concrete can be made at home most concrete today can only be made by your local ready-mix concrete manufacturer and delivered ready-to- use in a ready-mix concrete truck. Anyone in the cement and concrete business would be happy to answer any questions you might have regarding concrete, the most widely used and versatile building material in our society. The great forests of North America supplied abundant lumber to establish wood frame housing as the industry standard. Recently the increased cost of logging and its pressure on the environment have caused people to turn to viable alternatives. One is concrete. It has long been used for foundations and block buildings. Recently the mating of polystyrene’s insulating qualities and concrete’s structural strength has produced superior building systems designed as a replacement for wood in the home housing market. Building with insulated concrete forms, or ICFs, is steadily gaining in popularity. The reasons vary but generally fall into two categories, ease of construction and insulating value. Although panel style forms are adequate for foundations, when building to the rafters with ICF’s, the block styles are best. These stack together like giant Lego blocks and once filled with concrete and rebar then become the bearing and interior walls. The insulation remains in place thus eliminating the need for wood studs, bat insulation, interior vapor barrier, sheathing and house wrap. The insulating value is such that a much smaller heating system is installed. In hot climates air-conditioning costs are drastically reduced. Proper curing takes place inside the forms assuring the concrete of its designed structural strength. Insulated Concrete Form houses are very quiet, and for this reason more and more apartments are being constructed using ICF. Recently they have edged out wood frame in initial cost. Time-wise it is a cost effective way to build shops and warehouses. These homes are finished to look the same as any other on the block. Even inside it is hard to tell they are concrete supported. They are warm in the winter, cool in the summer and generally a pleasure to live in. Most people today are concerned about the environment and, given a choice, will do what they can to minimize the impact that their decisions make on our fragile ecosystems. When trying to assess the vast array of building materials available today, one might ask which is the most environmentally friendly building material for their new home. Concrete is made from sand, common stone, water, cement and fly ash. In order to look at its “environmental friendliness” we need to look at each of its individual parts in addition to the material as a whole. Sand and stone are arguably the most common materials on the planet earth. Most sand and stone for concrete is dug from gravel pits, which are by their nature, noisy and dirty places but, they don’t stay that way. One need only take a drive out to Coquitlam in the lower mainland of British Columbia. Spend a day at Lafarge Lake to see what can be made of an old gravel pit. This is a beautiful park with a running track, stadium and other facilities set around a small lake. Many gravel pits no longer in use have been similarly renovated. Thus it may be argued that not only does this part of the concrete making process not deplete the environment but it often leaves beautiful recreational areas in its wake. Cement is the primary active ingredient in concrete and is manufactured using mostly limestone, sand and clay, all abundant materials. These materials are typically quarried with the old pits again often leaving behind beautiful recreation facilities. One example of an abandoned limestone quarry is Butchart Gardens in Victoria, British Columbia. These materials are “burned” in a kiln using mostly fossil fuels as a source of heat and then ground into the final product, Portland cement. Unfortunately all building materials require some level of energy consumption in their production. A way to measure materials against one another is to examine the total “embodied energy” for a given building. Embodied energy, in this instance, is all the energy used to extract or produce the material up to construction site delivery. Studies show that concrete compares favorably to other building materials in terms of both embodied energy as well as total carbon dioxide emissions. The final major ingredient of most concrete is fly ash. Fly ash is a by-product of coal fired generating stations. Fly ash used to be sent to landfills. Then it was found that by substituting fly ash for some of the cement in concrete many of the desirable properties of concrete could be enhanced. As added bonuses, fly ash both lowers the cement content of the concrete, thus saving some fossil fuel, and also reduces the amount of material going to a landfill. After all of this one might wonder why concrete is gray when it’s really one of the greenest building materials around. Click here for link to “Changes to CSA Designations” released in 2004. The use of de-icing salts or other chemicals may damage concrete. Studies show that salt and magnesium chloride, used in many commercial de-icing formulas, can be very damaging to new or improperly cured concrete surfaces. Here’s a link to a May 2014 news feature on CTV news in Edmonton, AB about the use of de-icers on concrete. “Caution to Homeowners” signage for Concrete BC members. Please call the Concrete BC office at 604-626-4141 if you would like copies of this 8.5 x 11″ poster. De-icing Salt On Concrete– Articles by nationally syndicated newspaper columnist Tim Carter. Effects of Magnesium Chloride on PCC Pavement & Structures – Effects of Magnesium Chloride on PCC Pavement & Structures by Transportation Research Board of the National Academies. Concrete flatwork over the years has tended to look all the same. It is usually grey, and it has a flat smooth finish. To add variety to slabs and patios people have long looked to the past when flag stone, cobble stone or large tiles were used to spice up their appearance. Stamped concrete can now fulfill that role with a variety of designs and textures. Stamping involves the use of rubber mats with the desired finish molded into the under surface. After a slab has been laid down a ‘release agent’ is applied to the surface of the concrete to assist in removing the forms. The rubber mats are then placed on the surface and walked on to transfer their impression to the concrete below. Numerous mats provide a continuous pattern. The mats are then lifted and the concrete is allowed to set under proper curing conditions. Many different patterns and colors now allow a wide array of three dimensional textures and designs. Random stone is still very popular as are the various cobble stone designs. These lend themselves to applications involving stairs and curving walks. Often stamped concrete is used in conjunction with smooth finished curbs to break up the expansive appearance of the walk or driveway and provide pleasing crack control. Stamping tile designs have become very popular. One example is European Fan. When used with a border of exposed or smooth finished concrete of contrasting color it produces a finish rivaling many genuine tile applications. The use of a high gloss sealer completes the look giving that glazed appearance. Even wood planking can be simulated. Concrete need no longer be gray and flat but has the ability to create excitement and beauty in whatever setting or imaginative use it’s chosen. Up until the mid 1980’s, exterior residential concrete such as driveways and patios were grey slabs with a plain broom finish. Starting about 1982, the ready-mixed concrete industry began to offer concrete with a wide range of colours and textures. Of these, the most popular has been exposed aggregate. The finish is rugged, slip resistant, durable and decorative. Exposed aggregate finishes can be used for the entire paved area, as a border, or for alternating panels. It is ideal for pool decks as well as driveways and patios. The colour and texture of the finished exposed aggregate surface will depend on the colour, shape and size of the stones. In the Greater Vancouver area, blackish-grey is a standard finish. In other areas of BC the colour will vary. The standard aggregate size is 10mm or 15mm. The concrete mix should be ordered according to CSA 23.1 specifications and should be at least a 30 MPa mix with 5% to 7% air content and a maximum slump of 80mm. The 30 MPa will give you a higher cement content and the lower slump will prevent segregation, honeycombing and flow lines. Some ready-mixed concrete producers may offer proprietary exposed aggregate concrete mixes with, in some cases, a warranty .When ordering, be sure to explain to your concrete contractor where you will be using the product and, if possible, ask to see samples of the finished product to ensure that the finish you desire is the finish you end up with. Although integral concrete is the most prevalent method, seeded exposed aggregate concrete can be used for special finishes. Aggregate such as crushed stone or marble is normally embedded into bull floated concrete by tapping with a wooden hand float or magnesium float. Sometimes a rolling device such as a large diameter pipe is used. This method is labor intensive, time consuming and consequently more expensive. In both cases a qualified, certified, professional concrete finishing contractor should be employed. They will know the best methods for retarding, exposing and curing the concrete. There are government environmental standards to be followed when washing off exposed aggregate concrete. Click here for a coloured, illustrated brochure outlining environmental guidelines for exposed aggregate concrete. When the year 1900 rolled around many city sidewalks were still made with wood planks, and expensive driveways were either cobblestone or gravel. Concrete use in land transportation was mainly by railroads who were content to use grey as their theme color. Although white cement powder has long been available for architectural concrete it was not until builders began demanding pastels that coloring grey concrete came into widespread use. Soon colored concrete found its way into the residential market, where those who could afford it paved their driveways and walks with something different. Today the use of colors from slate black to deep reds, California beige to Spanish brick, and almost any shade in between, are available at a reasonable cost. Concrete can be colored by either adding a coloring agent to the surface layer, the “shake” method, or by adding color throughout the entire batch of concrete. This is referred to as “integral’ color. Both methods have their advantages and disadvantages. Generally, deeper colors can be produced by the shake method, in which the coloring agent is sprinkled onto the wet surface and smoothed in during finishing. This is not a job for the amateur and requires considerable experience to obtain a proper bond between the surface and underlying layer to retain the concrete’s freeze/thaw durability. The downside of the shake method is that over time the use of de-icing chemicals, cracking or even heavy traffic wear can cause the surface to break down or wear away, exposing the grey concrete underneath. Adding a coloring agent during the batching of the concrete mix is done at the ready-mix plant. Integral color, while tending to be less vibrant, is available in all the shades of the shake method. Surfaces made with integral color concrete will continue to show their true colors forever, regardless of wear or damage, as the color is throughout the entire body of the pour. Either method will add excitement to an age old building product and add enduring life and excitement to your new or existing home. It’s finally finished! Your new concrete driveway, patio or pool is poured and the work crew has cleaned up and is driving away. Nothing to do now but sit back and enjoy it, right? Wrong! Two simple but important procedures, curing and sealing, still need to be done to ensure years of trouble free enjoyment and use of your new concrete addition. Curing is the procedure by which you ensure that your concrete continues to gain its desirable properties. Sealing will protect your concrete from surface contamination. To properly cure your concrete you need to keep the top surface continuously wet for at least 3 days and preferably 7 days. The surface can be kept wet in a number of different ways. Some of the most common methods of curing are: using sprinklers or soaker hoses to continuously apply water, apply wet burlap over the surface and wet down periodically, or cover with plastic to keep the surface water in. Curing is a procedure very easily performed by the homeowner although the contractor may be a good source of ideas for the best curing procedure to use. Not curing the concrete can lead to: lower ultimate strength, lowered durability, more cracking, larger cracks forming, and higher chances of salt damage. Almost all concrete defects that can occur are more likely to occur to concrete that is not cured. Curing should be started immediately after the final finishing stage is completed. Sealing concrete entails applying a liquid concrete sealer to the finished surface. This sealer can be applied either with a roller or by using a simple garden sprayer. There are many sealers available on the market that will give different final finishes. Most hardware or concrete supply stores will have a selection of sealers. Your concrete finisher would likely be willing to do this job for you. With a few suggestions from your supplier, it is an easy task for the homeowner to accomplish. Concrete is inherently a porous material, which is susceptible to staining from liquids seeping into the surface. It can also be attacked by harsh chemicals such as oils, antifreeze, or even drinks seeping into the porous surface. Sealing your concrete does essentially what it sounds like, that is, it seals the surface. Thus by sealing, the concrete can be protected from attack or staining. Sealing should be performed several weeks after curing has finished and after several days of dry weather to allow the concrete to dry. Curing is one of the most critical steps in the concrete finishing process and also the step most commonly missed. Through proper curing and sealing, in conjunction with other correct concrete practices, you can ensure that your beautiful concrete job of today stays that way for years to come. Although concrete can be frozen in its early stages of setting, it is a risky business and one is better off taking steps to prevent it. Ideally, the pour should be kept warm until a 7 MPa strength is attained before allowing the concrete to cool and freeze. While frozen, concrete will continue to slowly gain strength and once thawed reach its design strength. Using chemical accelerators in winter will speed up the initial set, reducing both the time and expense needed to keep the concrete heated. The thicker a slab or wall, the more internal heat it will generate. Consider ordering a richer mix that has more cement powder. It will generate more heat and set quicker. Insulating blankets placed over the slab can play a double role in both keeping the surface from freezing and helping in the curing of the slab. Placing insulation over frozen ground for a few days can cause it to thaw. Where the frost is deeper, the ground may have to be heated. Again, insulated thermal blankets can be used to cover concrete work and keep in the heat produced by setting concrete. Be sure to check corners and edges, as these places are more susceptible to cold air creeping in and freezing the concrete work. Covering the area with plastic and heating the interior, commonly called hoarding, will allow the concrete to set in warmer conditions. Avoid venting space heaters inside a heated enclosure, as the carbon dioxide produced will react with the setting concrete resulting in a powdery surface. Consider using ICF’s, or Insulated Concrete Forms for walls. These will prevent freezing and reduce or even eliminate the need for a heated enclosure. Covering the top of these forms is essential to retain all the heat of hydration. These forms take advantage of all the heat produced and cool gradually preventing thermal shock. Why risk a solid investment? Follow the recommendations listed above to worry free winter concrete work. *This is a minimum; generally concrete kept above the freezing point will attain 3.5 MPa within 24 hours. Pick up a flat sponge left in the laundry tub for a day or two. The topside will be hard and dry, while underneath it is still soft and wet. This will also form the sponge into a shallow curve. Why? When drying out, it shrinks in size and because the bottom stays wet longer, it forces the upward curl. Concrete acts in a similar manner. After being properly cured concrete will also shrink as it dries. An average concrete slab will shrink 3/4 of an inch for every 100 feet of length. The underside, bound to the sub-grade that prevents it from contracting over its entire length builds internal stresses resulting in shrinkage cracks generally spaced about 20 feet apart. Unfortunately, excess water is sometimes added to the concrete load at the job site. Making the concrete easier to handle by adding water is a short-term solution that will leave long lasting results – more cracks. The wetter the mix laid down, the more it will shrink and crack. Unplanned cracks are usually in the wrong place and never straight. We can design cracks that are pleasing to look at. They are called joints. By grooving the slab at predetermined intervals before it sets, or saw cutting it shortly after setting, we can force the cracks to appear where we want them. As an added bonus the crack is hidden beneath a surface feature that can very aesthetically attractive. Curing is the final step in the process of producing a quality concrete slab. Curing entails keeping the surface of the concrete wet and safe from freezing. Curing during warm weather is accomplished using sprinklers, wet burlap, soaker hoses or a combination thereof. If there is a danger of freezing, thermal blankets, usually available at tool rental stores, should be put over the wet burlap. Concrete that has not been cured but allowed to dry out the next day will tend to have more unsightly cracks. It simply lacks the strength needed to hold itself together. Curing is essential for three days, and recommended for seven days, to prevent unwanted shrinkage cracking. Follow these simple steps and beautiful concrete will showcase your home for decades! Your dream is about to come true; you have found a house that could probably be your dream home. Yet, when homebuyers look at residential properties, attention is paid to appearance, quality of workmanship and suitability of the structure to their needs. However, more often than not, what you can’t see in a home is just as important. And one of the things you can’t see is the concrete slab. Most people would disagree, pointing out that the gleaming-white driveways and sidewalks of new homes, the floors of unfinished basements and custom-finished patios are all made of concrete – and all plainly visible to the naked eye. While what you see of finished surface is important, it’s what you don’t see that can really make a difference – the concrete mix design, the structural capacity of the concrete slab or foundation, and the placement practices used. Depending on the quality of the concrete structure, a homeowner could end up with a basement floor that will last the lifetime of a house or a driveway with cracks so large grass grows through them. And these problems may not become evident until it’s too late. Cracking can be a homeowner’s worst nightmare. Whether the problem is a sidewalk with more cracks than joints or an unsightly cracking patio, cracking in concrete is a serious problem. And when confronted after the fact, the solutions to ugly cracking are often just as serious and costly. So why does concrete crack? Concrete is a brittle material and cracks due to inability to flex under stress. Cracks easily spread through plain concrete because there are no fibers present to hold the matrix together. Remember that cracks visible on the surface of concrete are usually the end result of months or even years of interior micro-crack formation, likely from microscopic fissures in the concrete formed during the curing, or drying, process after the concrete was placed. These fissures developed as excess water came out of the concrete, creating stresses that pulled it apart. The crevices then grew into cracks because the welded wire reinforcing was either not properly placed and did not inhibit their formation or was left out altogether. For years, the tendency for concrete to develop shrinkage cracks during the curing process has been accepted as natural to its use. The problem has been the inability to effectively limit the formation of these stress cracks. Today, fiber-reinforced concrete is minimizing those problems. The use of a fiber reinforcement system, good concrete, and good concreting practices, a quality structure that actually inhibits the formation of cracking can be achieved. There are several well established manufacturers of polypropylene fibers and with a decade of use in the concrete industry, fibers reduce intrinsic cracking, provide toughness to the concrete, provide lower permeability, add ductility and increase resistance to dynamic loads by providing impact and abrasion resistance. When used according to specifications, these synthetic fibers inhibit 80-100 percent of the cracking typical in freshly placed concrete and provide toughness in the hardened concrete, helping contain any cracks should they occur. The disbursement of millions of these tiny plastic fibers actually holds the concrete together and prevents microscopic fissures from becoming large cracks visible at the surface. The result is an easily implemented, cost-effective and uniformly distributed reinforcement system that is always placed correctly, fights cracking and provides wear protection for years to come. Millions of cubic yards of fiber reinforced concrete are placed around the world each year. About 40 percent of that concrete is reinforcing the value of a homebuyer’s new dream home. Secondary reinforcement is not an answer to concrete cracking due to sub-grade failure. When the soil beneath the slab gives way, secondary reinforcement cannot help. But homeowners with a well-prepared site, who use fibers in their concrete in conjunction with good concreting practices, can expect the driveway they just installed to remain structurally sound and beautiful well into the next century. Like most things in this world, over time, your concrete can start to look a little worse for wear. The most frequent complaints about older concrete slabs are unsightly cracking, uneven settlement, or just general dirt and grime discoloration. Cracking is a natural phenomenon of concrete and should be expected. Control joints, or those straight lines that are usually scored into the concrete, are to ensure that the concrete cracks both where you want it to and in a straight line. Discontinuous cracks and cracks away from the control joints sometimes occur and can be repaired to an extent. If the cracking is too bad you may want to replace the entire slab. Further information on concrete cracking, its causes and cures can be obtained through the BC Ready-Mixed Concrete Association or your local ready-mixed concrete supplier. Dirt and grime can be easily removed form concrete in a couple of ways. The easiest method is through the use of a pressure washer. Pressure washers increase the water pressure from your household system through a series of pumps. Care should be taken to ensure that the pressure at the end of the washer wand is not above 2500 psi as pressures above this level can harm the concrete surface. The use of hot water and running an alkali cleaning solution (made for pressure washing concrete) through the pressure washer can be used to enhance the cleaning performance. Note that pressure washing can cause loose or poorly bonded concrete to be blasted away so a thorough inspection of the concrete to be cleaned should be done prior to starting with the pressure washer. A stiff broom and a cleaning solution will also usually do an acceptable job of cleaning most dirt and environmental buildup from your concrete. The cleaner should be an industrial strength alkali cleaner available from your local hardware store. Some people recommend using acid to clean concrete. This is definitely not the right thing to do as acids react with the cement paste in the surface of the concrete and will eat away or weaken the surface layer of your concrete. Acids are sometimes used on new exposed aggregate concrete as the final finishing step before sealing the surface but this is a specific application and should only be done after consultation with a professional from the concrete industry. If you are having trouble getting tough stains from your concrete, follow this link to the National Research Council Canada for more information on the removal of stains from concrete surfaces. Once the concrete has been cleaned a good quality acrylic concrete sealer should be applied. The sealer protects the concrete from staining and also makes it a lot easier to clean the next time. Sealers are available in gloss, semi-gloss and satin finishes. A good quality sealer is available from a concrete supply store. Leveling an uneven slab, or portion thereof, can be both difficult and expensive. If the uneven area in question is small the solution may be through the use of a concrete patching compound. These compounds are typically a pre-blended bagged product, which are designed to bond to the existing concrete and able to be feathered down to the existing slab so that there is no noticeable lip at the interface between the old concrete and the patch. This job is easily within the realm of the home handyman and the materials are again available from your local hardware store. Note that you should be very diligent in following the slab preparation instructions to ensure that a good bond between the old concrete and patch is achieved, otherwise you can’t expect the patch to last. If you have a large area which has settled and needs to be lifted or re-leveled you will probably need to contact a professional. Slab-lifting is possible by the use of a technique called “slab jacking” in which a free flowing concrete grout is pumped through the slab and forms a lens between the bottom of the slab and the soil below. The pressure exerted by the pump causes the slab to lift. To find a company who does this kind of work, contact your local ready mixed concrete supplier or again Concrete BC. If you have questions about concrete not covered in these article please contact either your local ready mixed concrete supplier, Concrete BC or the Canadian Cement Association. Concrete BC, in conjunction with Millennium EMS Solutions Ltd., has prepared a Guide to the Code of Practice for the BC Concrete and Concrete Products Industry. This document is intended to provide a broad overview of the Ministry of Environment’s requirements with respect to waste and waste discharges that may result from the activities and operations of the concrete and concrete products industry, and provides suggestions for achieving targets for compliance with the BC Code of Practice. This guidance document does not replace or affect the actual legislative requirements, and if there is any conflict between this document and the Environment Management Act or its regulations, the cited Acts and the regulations take precedence. Click on the link below to access document. The Best Management Practices (BMPs) or methods for disposing of wash-off water can be classified in two broad categories. 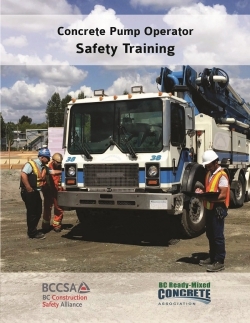 The BCRMCA Pumping Committee and the BC Construction Safety Alliance (BCCSA), with support from WorkSafe BC, are pleased to launch BC’s first ever Concrete Pump Operator’s Safety Training Manual. The manual identifies and clarifies the specific basic information needed for concrete pump operators to perform their work safely and effectively. This course was updated in 2016 to reflect the changes in this dynamic industry. Please contact the office if you are interested in purchasing a training manual. Concrete BC will be delivering this information in a series of one day workshops focused on teaching this basic training standard. Click below for more recommended information regarding Concrete Pumps. One of the functions of Concrete BC is the circulation among its members of technical information about ready mixed concrete plant equipment and facilities, so that member company plants may be built and maintained to the highest level of efficiency and operation. To enable the members of the Association to provide assurance to their customers that their equipment is in good operating condition and has the capability of producing quality concrete, the Association offfers the “Certification of Ready Mixed Concrete Production Facilities” (the Audit Check List) prepared under the direction of the Concrete BC Technical Committee. This document is based on the National Ready Mixed Concrete Association (NRMCA) plant certification check list, and the plant certification programs by the Alberta Ready Mixed Concrete Association (ARMCA), the Atlantic Concrete Association (ACA) and the Ready-Mixed Concrete Association of Ontario (RMCAO), and current Canadian Standards Association (CSA) requirements for plant, equipment, and materials. This document, detailing the requirements for plant certification, provides producers with the means of obtaining a Certificate for display which indicates that the plant, because it has the proper equipment, in good operating condition, has the capability of producing quality concrete. To be eligible for a this certification the plant must be inspected by a Concrete BC accredited professional engineer, registered in the province of British Columbia, and conform to the Audit Check List. In addition to carrying the signature and seal of the inspecting engineer, the Certificate must be signed by the principal company executive attesting that all equipment and materials will be maintained within the requirements of the Audit Check List. The full cost of inspections will be borne by the producer member. Engineer reports are required in Year 1. The plants current scale calibration reports along with a signed Members Agreement must be submitted in Year 2 and Year 3 for issuance of certificate and decal. *This rate differential is based on the fact that Plant Certification is a Concrete BC Member Benefit and that, as non-members, there is no way to confirm that the companies adhere to the Concrete BC Code of Conduct. The certification documentation, registration and maintenance is funded by member dues so cost recovery on time and infrastructure required to maintain the program is also included. For more information please contact the Concrete BC office by phone at 604-626-4141 or concrete@concretebc.ca. The following facilities in British Columbia are currently certified under the Concrete BC Concrete Plant Certification Program. They have been inspected by a Concrete BC accredited professional engineer, and found to be in compliance with the Concrete BC Audit Checklist for Plant Certification. Note: This certification indicates only that plant facilities are satisfactory for the production of concrete when properly operated. Conformance of the concrete itself to specification requirements must be verified by usual inspection methods in accordance with sales agreements and CSA Standards. Poured-in-place concrete walls are cost effective since they combine the functions of a strucural element and an exterior wall assembly. Concrete also provides great flexibility and simplicity in building design. Close attention needs to be paid to moisture management strategies to avoid both rainwater penetration and interior moisture caused by condensation. This bulletin, from the HPO, highlights various strategies and steps that can be taken to facilitate continued effective design and construction practices for exposed poured-in-place concrete walls. November 2010, Amendment to the BC Building Code from the BC Building and Safety Standards Branch – By order of Rich Coleman, Minister of Public Safety and Solicitor General and Minister Responsible for Housing, Portland-limestone cement was recognized by the British Columbia Building Code on Thursday November 25, 2010. The cement industry is now clear to start shipping PLC in British Columbia. If you operate or own a crane, WorkSafeBC regulation 14.34.1 states that after July 1, 2007, a mobile crane, tower crane or boom-truck must be operated only (a) by a person with a valid operator’s certificate issued by a person acceptable to the Board, and (b) in accordance with any conditions stipulated on the certificate by the issuing person. Operators who possess a crane operator trades qualification certificate issued in BC by the former Industry Training Authority and Apprenticeship Commission (ITAC), or a Red Seal, do not need to undergo the assessment. The ITAC-issued qualification card or Red Seal is sufficient to meet WorkSafe BC’s crane operator requirements. All other crane operators in the Province of British Columbia have until February 28, 2011 to be assessed. More detailed information on crane operator assessment and certification can be found on the WorkSafeBC website and the Fulford Harbour Group website. Requires owners of BC registered on-road commercial heavy duty diesel vehicles (model years 1989-1993) with a licensed gross vehicle weight (GVW) over 8,200 kg to retrofit their engines with devices that reduce particulate matter emissions. A Diesel Oxidation Catalyst (D.O.C.) is a device installed within the exhaust system that will not have an adverse affect on fuel economy that requires little or no maintenance. A D.O.C. reduces the particulate matter emissions by 20-50 percent and hydrocarbon and carbon monoxide by 40-90 percent. Inland Kenworth has partnered with Donaldson Emissions to help provide the BC trucking industry with the required retrofits before the fall deadline. Or direct your questions to CTBTaxQuestions@gov.bc.ca by email.